The Eastern Long Island Chapter is proud of its role in the making of the new short film Into the Sea by local filmmaker and pro-surfer Mikey DeTemple. The film highlights how important clean water and clean beaches are to all of us living on and visiting the east end. Into The Sea from Surfrider Foundation on Vimeo. Into the Sea makes the connection between how we manage our lawn and gardens at home and the health of our local waterways, calling on us all to take responsibility to make changes to protect our own health and to prevent pollution from contaminating our bays, ponds and ocean. With high bacteria counts being measured after it rains by our Blue Water Task Force water testing program and continued problems this summer with toxic blue-green algae blooms in our ponds and rust tide in the bay, there has never been a more important time to act. Get dirty! Stop using chemical fertilizers and pesticides and pull weeds by hand instead. Mulch, mulch, mulch. Apply organic compost to your yard and garden and cover it with mulch to build healthy, living soil that acts like a sponge to hold onto rain for your plants’ use during dry months. Soil microbes, which are like probiotics, help the soil’s ability to absorb nutrients and resist drought, disease and pests and aid in cleaning up pollution and capturing carbon that plants absorb from the atmosphere. Compost. Make your own soil amendments by composting your yard and kitchen scraps in a compost or worm bin. Go native! Plant native plants and grasses that don’t need supplemental irrigation when they are fully-grown. You’ll also be providing food and habitat for butterflies, birds and bees. Shape your garden to slow down and soak up rainwater. Leave a natural buffer or slightly raised border around the edge of your yard to prevent runoff from leaving your property and polluting local waterways. Barrel on! Install a rain barrel to store rainwater for future watering needs, and direct the overflow into the landscape and not onto the driveway and out to a storm drain. 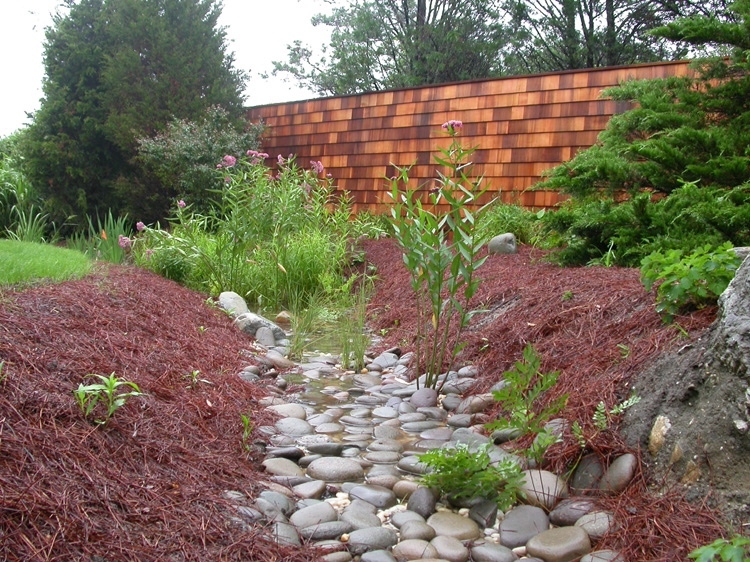 If rain barrels are not an option, direct gutters to the landscape. This reduces flooding and keeps polluted runoff from reaching the ocean. Mind the gap. Make your walkways and driveways permeable by cutting gaps in them or make sure they are pitched to drain into your yard. You can also join the Surfrider Foundation and help support our work to protect clean water. Just click here. The Eastern Long Island Chapter looks forward to continuing to build awareness of the benefits of Ocean Friendly Gardens by partnering with Freddie Friedler and Marders Nursery & Landscaping to install a demonstration garden in Amagansett Square and with the East Hampton Village and the Ladies’ Village Improvement Society on a garden project to clean up road runoff on the East Hampton Village Green. We would like to thank everyone who was involved in putting together this great film: Filmmaker Mikey DeTemple, Executive Producer Nicole Delma and Fond Group, the Huck production team, and Surfrider staff Mara Dias, Paul Herzog, Ty Smith and Colleen Henn. Read an interview of Mikey DeTemple on TheInertia.com where he discusses his inspiration for Into the Sea.